AboutAcura: Honda Announces "Earth Dreams Technology"
Honda Announces "Earth Dreams Technology"
"Earth Dreams Technology" is a next generation set of technological advancements which greatly enhance both driving performance and fuel efficiency at a high level, using as its base advanced environmental technologies to pursue the joy of driving unique to Honda. It is a series of measures in which efficiency of internal combustion components including engine, and transmission, as well as electric-powered motor technology, is further improved. Through its implementation first in the mini-vehicle N BOX and gradually onto other vehicle models, Honda aims to achieve top-of-industry fuel efficiency for every category within three years, while simultaneously setting a timeline of 2020 to reduce by 30% CO2 emissions for all products sold worldwide, relative to emission figures for 2000. Inspiration of the "Earth Dreams Technology" name: "Earth Dreams Technology" is an expression for a set of technologies which takes into account both our need to protect the environment and our desire to provide a joy of driving. By enhancing Honda's original VTEC (Variable Valve Timing and Lift Electronic Control System) technology to thoroughly improve thermal efficiency and minimize friction, a combination of high output and fuel efficiency was achieved. Further, a new engine series employing a new structure for higher expandability was developed. By gradually renewing the engine starting with the mini-vehicle N BOX, Honda aims to utilize this technology to achieve top-of-industry output and fuel efficiency in every vehicle class within three years. A wide range of engine classes including the 660cc, 1.3L, 1.5L, 1.8L, 2.0L, 2.4L, and 3.5L classes will feature the technology. Employs DOHC and VTC (Variable Timing Control) to improve intake efficiency. Further, the compact combustion chamber realizes high thermal efficiency. By shortening the bore pitch compared to the present engine models and reducing the thickness of the cylinder block and camshaft, engine weight is reduced by 15%*3 and fuel efficiency is improved by 10%*3. Employs VTC, direct injection technology and the Atkinson cycle using the DOHC, VTEC technologies as the base. Extensive friction reduction measures are implemented. Employs direct injection technology and the Atkinson cycle using the DOHC, VTEC technologies as the base. Further, implementation of VTC and high-capacity EGR (Exhaust Gas Recirculation) to both the intake and exhaust ports realizes significantly reduced friction. 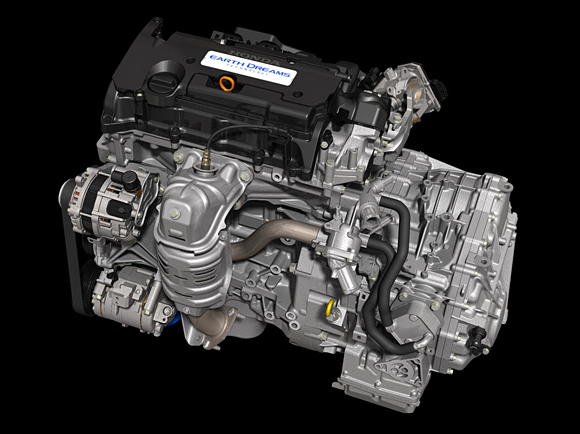 For the 2.0L class hybrid vehicle engines, use of an electric water pump eliminates the need for a belt in the auxiliary device and contributes to a reduction in friction. The VTC system allows fuel-efficient driving in various driving styles. Based on the DOHC and VTEC technologies, it employs VTC and direct injection technology and implements extensive friction reduction measures. Standalone engine features 5%*3 improvements in fuel efficiency and output as well as a 10%*3 improvement in maximum torque compared to the previous engine. Employs new valve train mechanisms and direct injection technology in the SOHC, VTEC, VMC systems to improve by over 10%*3 of fuel efficiency and 5%*3 of output, relative to the present standalone engine model. 2. A compact diesel engine which realizes the world's lightest body*1, top-of-class*1 acceleration performance and fuel efficiency. 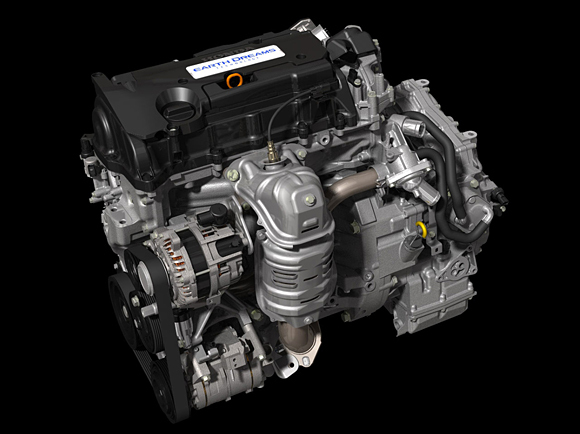 Through optimizing engine rigidity and combustion pressure, an aluminum open deck for the cylinder block was enabled in this top-of-industry lightweight*1 1.6L class diesel engine. By downsizing from the present 2.2L engine and extensively reducing mechanical friction in each section, a friction level equivalent to present gasoline engine models was achieved. Optimized thermal management system thanks to improvements in the cooling system reduces CO2 output by over 15%*3. Employment of a compact, high-efficiency turbocharger and weight reduction in the reciprocating sliding section realizes a sporty and nimble ride. 3. CVT which combines at a high level the fun of driving and fuel efficiency. Three CVT structures for mini, compact, and mid-size vehicle classes are newly developed to be adopted for a variety of engine models. Reinforced belt is used to realize a structure for which a wide ratio range can be set. Implementation of analysis technology over the contact behavior between the belt and pulley, and a high-precision hydraulic control system allows for continual optimization of hydraulic pressure to the pulley under a variety of driving conditions, contributing to improved fuel efficiency. Use of an electronic oil pump to realize an idle stop system with high response contributes significantly to improved usability and fuel efficiency. "G-Design Shift", a new coordinated control system for shift transmission, throttle, and hydraulic control responds quickly to driver demands and realizes an exhilarating, sporty drive with superior acceleration. In the mini-vehicle class, a control mechanism and innovations in axle placement to reduce the engine size lengthwise, while a reduction in parts by simplifying the transmission casing structure helps realize a lightweight and compact body. For the compact and mid-size classes, in addition to the reductions in size and weight, transmission efficiency was greatly improved by expanding the ratio range to achieve fuel efficiency improvements of 5%*3 and 10%*3 compared to the conventional CVT and comparable 5ATs, respectively. A two-motor hybrid system featuring top-of-industry efficiency*1 enhancing driving performance and reduced CO2 emissions has been newly developed. Special lithium-ion battery and charger is employed to enable mounting on plug-in hybrid vehicles. Mid-sized vehicles equipped with this system are scheduled to begin production, starting with the plug-in hybrid model in 2012 and the hybrid model in 2013. Three driving modes allowing for top-of-industry efficiency*1 for various driving environments were developed; an "EV driving mode" for urban environments, a "hybrid driving mode" using electricity generated by the motor, and a "engine-connected driving mode" where the engine and tires are mechanically connected during high-speed cruising. Combination with a high-output 120kW motor allows for superior environmental performance and driving enjoyment. 5. A high-efficiency, high output electric SH-AWD hybrid system which combines superior driving and environmental performance. A new hybrid system, electric SH-AWD, was developed for large-sized vehicles. By combining a 3.5L, V6 engine with this hybrid system, acceleration equivalent to V8 engines, as well as fuel efficiency equal or superior to in-line 4-cylinder engines were realized. An electric 4WD system with independent 20kW+ motors on both sides for the rear wheels combines a 7-speed dual clutch transmission system with a built-in 30kW+ high-efficiency motor with the engine. By mounting a high-performance lithium-ion battery and optimally controlling the front and rear motors, a new hybrid system with high fuel efficiency and output was realized. By mounting two independent motors in the rear and employing a newly developed bilateral torque adjustable control system, incredibly tight cornering just like driving "on-the-rail" is realized. With this mechanism, Honda strives to provide a stable ride for various driving environments. 6. A compact, high efficiency electric powertrain for EVs. Thanks to the high efficiency coaxial motor, low-friction gearbox and electric servo brake system, the system realizes the highest electrical consumption capability in the world*1, meeting the required AC consumption rate of 29kWh/100mile(116MPGe) as set forth by the United States. A traveling distance of 123 miles*2(LA-4mode: unadjusted) or 210km*2(JC08 mode) was achieved thanks to the mounting of a high capacity lithium-ion battery. By offering three driving modes (SPORT, NORMAL, ECON), the driver can freely select from a number of options to meet the needs of various driving styles such as power-saving or sporty drive. [Rumors] New 2013 Acura NSX?